Experimental design of parallel computers calls for quantifiable methods to compare and evaluate the requirements of different workloads within an application domain. 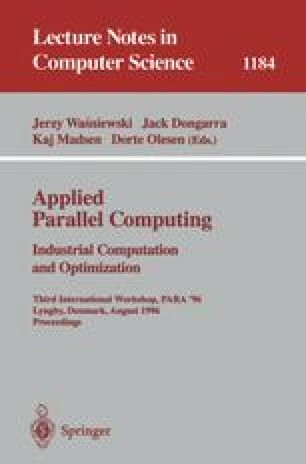 Such metrics can help establish the basis for scientific design of parallel computers driven by application needs, to optimize performance to cost. In this work, a parallelism-based framework is presented for representing and comparing workloads, based on the way they would exercise parallel machines. This method is architecture-invariant and can be used effectively for the comparison of workloads and assessing resource requirements. Our workload characterization is derived from parallel instruction centroid and parallel workload similarity. The centroid is a workload approximation which captures the type and amount of parallel work generated by the workload on the average. The centroid is an efficient measure which aggregates average parallelism, instruction mix, and critical path length. When captured with abstracted information about communication requirements, the result is a powerful tool in understanding the requirements of workloads and their potential performance on target parallel machines. The parallel workload similarity is based on measuring the normalized Euclidean distance (ned), which provides an efficient means of comparing workloads, between workload centroids. This provides the basis for quantifiable analysis of workloads to make informed decisions on the composition of parallel benchmark suites. It is shown that this workload characterization method outperforms comparable ones in accuracy, as well as in time and space requirements. Analysis of the NAS Parallel Benchmark workloads and their performance is presented to demonstrate some of the applications and insight provided by this framework. The parallel-instruction workload model is used to study the similarities among the NAS Parallel Benchmark workloads in a quantitative manner. The results confirm that workloads in NPB represent a wide range of non-redundant benchmarks with different characteristics.